Gator spirit for students who are season ticket holders I walked through the football stadium to get to the college so I could walk past the ticket windows. The students were lined up to pick up their tickets to the UF-Hawaii football game. Student season ticket holders also received a special UF football T-shirt — with the Pepsi logo on the back of the shirt, as we are a Pepsi campus. Go Gators! I walked through the football stadium to get to the college so I could walk past the ticket windows. The students were lined up to pick up their tickets to the UF-Hawaii football game. 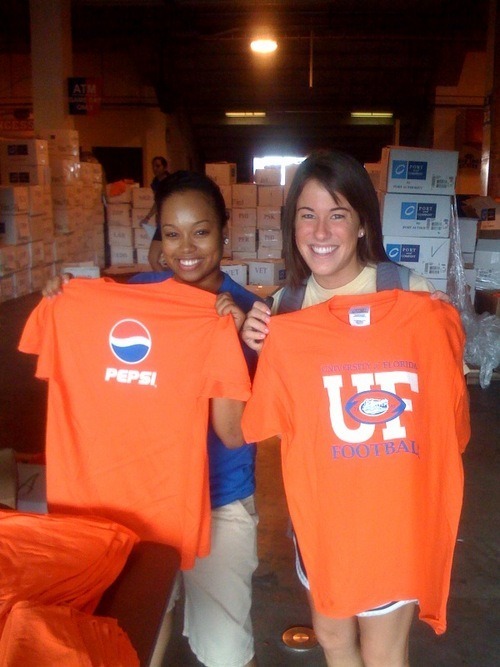 Student season ticket holders also received a special UF football T-shirt — with the Pepsi logo on the back of the shirt, as we are a Pepsi campus.